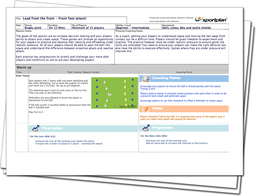 Improve your team's decision making and their ability to attack any space with this session! Ensure that your players lead from the front and go forward in attack with flair, making sure that your players help their team-mates out, by providing options and creating space from one another. This session allows your players to develop their passing whilst under realistic pressure, getting them ready for game day! By using exercises such as Crash and pop, work on your players' decision making and offloading, so your players are ready to offload into space for their team-mate to go on the front foot. It's vital that your team communicate with one another and make those all important runs into space! Go on the front foot in attack and lead from the front!